Product Description: Cal Flame 5-Piece Knock Down BBQ Island With 32-Inch Cal Flame Propane Gas BBQ Grill. Enjoy a resourceful accent to your outdoor patio. This outdoor BBQ island boasts a two-tone porcelain counter top in tropical cream and tropical brown with a stony creek Ameristone stucco base featuring a solid foot rest with 3-inch bottom trim. Enjoy easy assembly with the knock down design. This island also includes a Cal Flame G4 430-grade stainless steel drop-in grill with four (4) 15,000 BTU burners. Independent ignition on all burners means a reliable start every time. 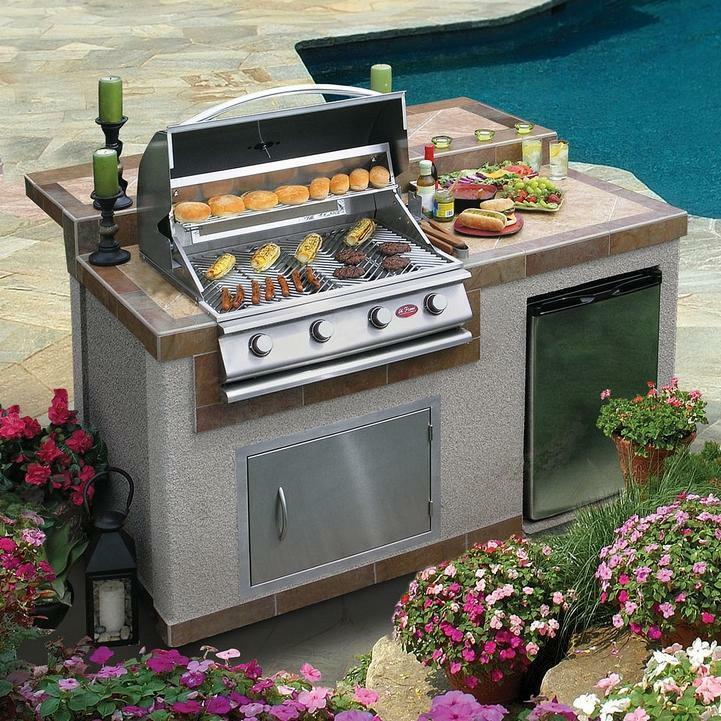 An 800 square inch cooking surface covers all your grilling needs. The grill lights enhance visibility during evening grilling. A front splash guard with vent keeps grease away from the exclusive, heavy-duty knobs. The thermometer lets you monitor your cooking conditions for grade-A results. The heavy-duty V-grates are removable and dishwasher-safe. A full-width drip tray and full-width warming rack with two positions extend your cooking options. The island also includes a Cal Flame drop-in single side burner with 15,000 BTUs of cooking power, infinite heat settings, and high quality 304 grade stainless steel construction. The burner cooking surface supports wok cooking for added versatility. The removable lid with handle preserves your burner while not in use. 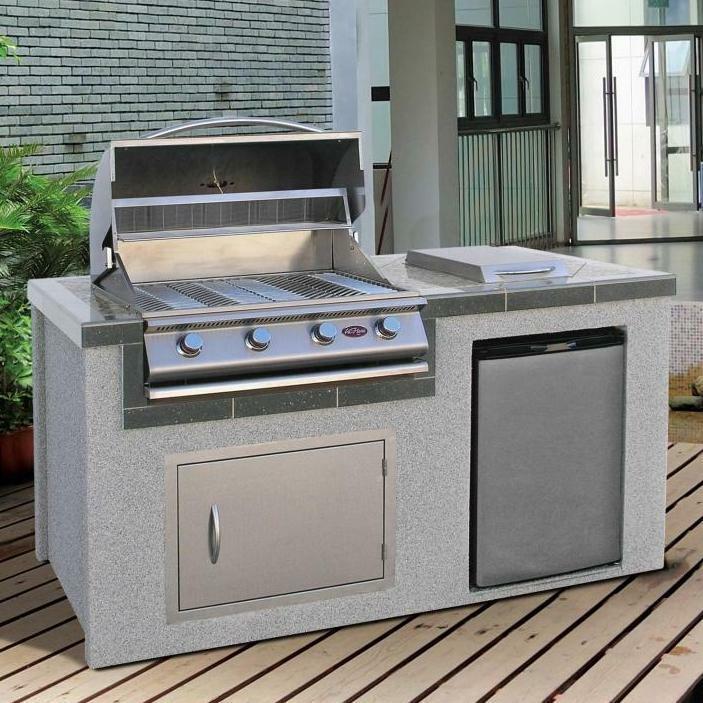 This BBQ island also includes a stainless steel access door with reversible hinge configuration. The 4. 6 cubic foot capacity solid stainless steel outdoor refrigerator with five (5) removable shelves and internal lighting keeps your grilling essentials fresh and ready for use. SHIPPED AS PROPANE - ORIFICES FOR CONVERSION ARE INCLUDED. CONVERSION MUST BE DONE BY A LICENSED PROFESSIONAL.